Maybe you've had a soul-sucking commute for years. Or maybe you just log way too many long days away from your family and faithful hound. So no wonder you'd love to find a comparable job with benefits that lets you work from home. The good news: That's now a real possibility at many companies, large and small. FlexJobs, a job board for those seeking telecommuting, remote or freelance work, just released its annual list of the top 100 companies that are hiring. The vast majority of them offer the most full-time telecommuting jobs of any employer in FlexJobs' database, which has 40,000 companies. Among the top 20 are UnitedHealth Group, Dell, IBM, Aetna, PAREXEL and SAP. The jobs run the gamut from senior- and mid-level management positions to mid-career non-management posts as well as entry-level opportunities. And they exist in several fields, including IT, health, sales, education and marketing. Some of the most common job titles that are hired for telecommuting are writer, engineer, project manager, IT analyst and sales representative. A full 30% of North American employees at SAP, the enterprise application software maker, telecommute full time. Right now the company is looking for a vice president to develop sales plans for its banking industry products. That new VP will likely report to the head of the financial services division, who himself telecommutes from Maryland, even though the hub for that division is New York. The growth in telecommuting at SAP has been fostered not only by technological innovation but by the growth of global teams. So even though the company has an office in Palo Alto, California, it may make more sense for a developer who lives there to telecommute anyway, if her whole team is based abroad. "Why go through the rigors of the commute?" said Jewell Parkinson, head of human resources for SAP North America. 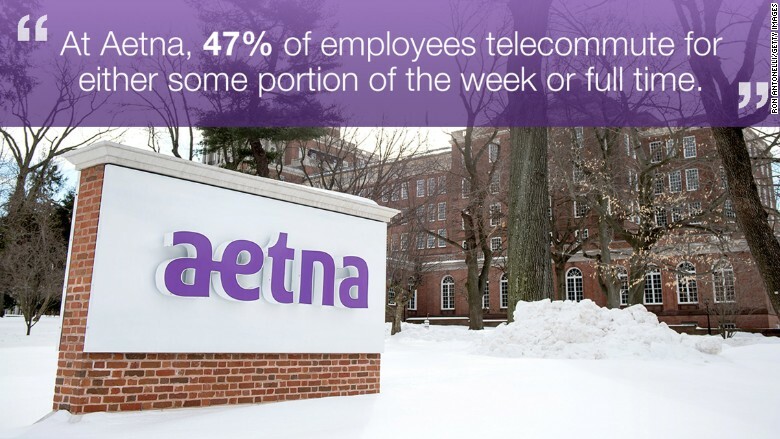 At health insurer Aetna, meanwhile, 47% of employees telecommute for either some portion of the week or full-time. The company is on the hunt for a doctor to serve as a full-time medical director. The job involves providing clinical expertise, offering case management consultation, and leading clinical improvement projects among other responsibilities. At PAREXEL, a biopharmaceutical services provider, 40% of its North American employees telecommute at least a day or two a week, if not every day. The Boston-based firm is on the hunt for a project manager in the Midwest to work from home full time. It's not surprising that PAREXEL -- or any other employer -- requires a telecommuting hire to live in a given area. Yes, often the promise of a telecommuting job is that you can live wherever you want and your employer can seek out the best talent wherever they live. But there could be several reasons why they would restrict the search to certain states or regions. Among them, clients you'll be working with may be located in that area, you may be required to report to meetings a few times a month at a regional office, or your employer may only process employment taxes in certain states. To make FlexJob's list, the companies seeking out telecommuters had to post at least 100 job openings for them in 2015, but those at the top typically posted thousands.